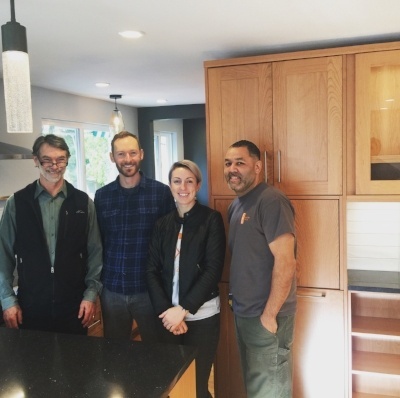 CRD's Design-Build Team re-invented our 1950's kitchen and finished part of our basement to create an entirely new living space and bathroom/ laundry room. We were impressed with Denny's team from the start. After spending just an hour in our space he was able to offer ideas and options we couldn't have imagined on our own. The design process was exciting and collaborative. Our designer, Leslie, took care to understand our aesthetics first and then build on them, shaping the result to fit the style of our home. We appreciated the detailed project timeline and that they did their best to stay on track and always keep us updated. They provided us a temporary kitchen and kept the work place clean and organized. We felt our lead carpenter, Matt, was incredibly conscientious and communicated with us well. Most importantly that he really cared about the work and making sure we were always getting exactly what we wanted. We would highly recommend the CRD team and look forward to working with them again in the future.